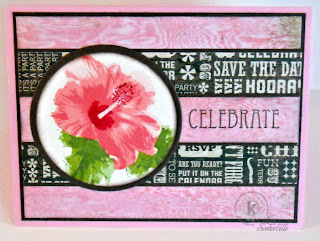 Designs by Lisa Somerville: Celebrate Good Times! Happy Kitchen Sink Stamps Monday, thanks for stopping by today, I hope you had a great weekend! I think Spring may have finally sprung here in the Midwest! Our temps made it up near 80 degrees yesterday! It sure didn't look like it was that warm out, as the flag and tress were whipping in the wind. I did get outside for a bit, trimming some of last years flowers, as the new growth was finally starting to shoot through. Beautiful flower! We need that with our cold weather that won't turn warm. The strips of pp really make it pop! Beautiful Hibiscus, I wish I could grow them to look like this! Glad your wether warmed up a tad,, hope it stays. hi Lisa- GORGEOUS card- the purse below is so pretty too! beautiful hibiscus colors! It got nice & warm here yesterday too, but Sat was super windy. Hope it's starting to turn the corner for warmer weather. Gorgeous card, love the coloring on that gorgeous flower! I love this gorgeous hibiscus! Our bushes froze back this year. I am sure hoping they recover and return! 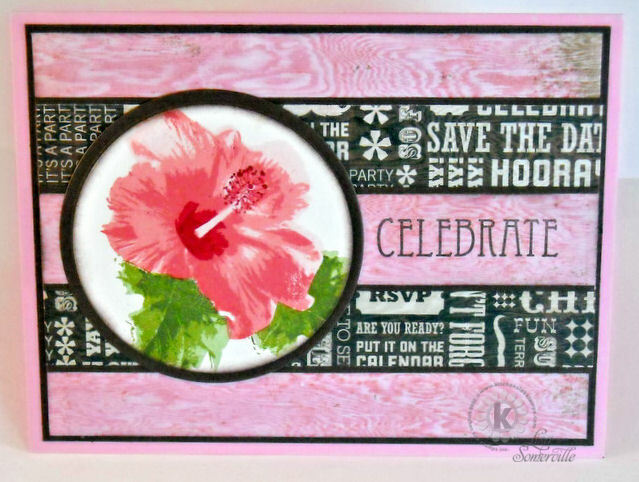 Beautiful work on this bright and cheerful card, Lisa! Oh Lisa! Your hibiscus is just perfect! Love the fun papers you used with it too!! Glad to hear it's starting to look like spring isn't it magical when everything starts appearing! Absolutely amazing! I love the color of the hibiscus! Fun birthday DP too.